Not the best quality, but some single track in the Community Forest just blocks from my house. My training grounds. 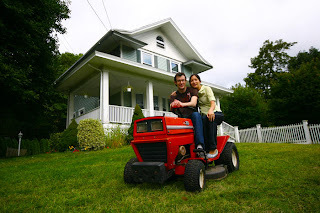 My good buddy, his wife Monica, and their new 1984 MTD riding lawn mower have a new place to call home. Congrats to you guys and good luck on the renovations. As a briefer, my buddy Andrew and myself had an awesome adventure together in the summer of 2002 right after we both graduated from Norther Michigan University. 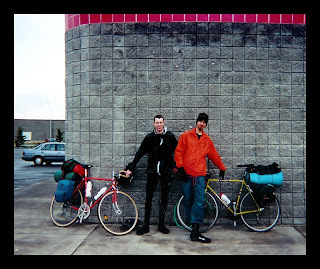 A friend of ours, who was headed up to Alaska to work on a fishing boat for the summer, dropped us off in Anacortes, WA where we proceeded to ride our bikes eastward toward a large body of water many folks call the Atlantic Ocean. It was a trip I'm sure both of us will never forget with many great memories and people along the way.